What do you do when you have certain requirements for a house that doesn’t fit with any property currently for sale in your local city? You build one of course! And that’s exactly what we are doing. 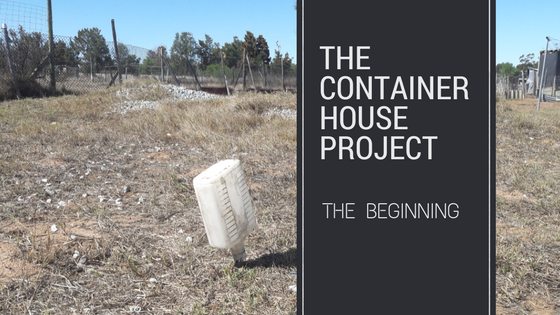 Kevin, Louis, Gwen, Cindy and myself (Ashley) are building a house in a rural area of the Western Cape, and this is where the very beginning of our project starts. Of course, the above paragraph would lead you to believe that this is an easy enterprise. Not exactly – firstly we had to find a piece of property. After that we had to have the house plans drawn. Our next step is to have them approved by an Engineer and the city council of the area. Only then can the actual building begin. All building plans also have to fit in with the legislation of that particular area and this had to be taken into consideration when planning our house. Surprisingly, it did not take us very long to find a suitable and spacious piece of ground in a neat rural residential area about 40km outside of Cape Town. We are very pleased with the location because it is still close enough to Cape Town in order to conduct business with Small Scale Engineering’s existing client base, and yet far enough out of town to really be able to embrace a country lifestyle. And yes, before you ask, we are still subject to Cape Town’s current water restrictions. Not Quite the Very Beginning – What’s Next? So we now have a plot of land, and an idea in mind for our grand project. So, what is next? Plotting and planning our new home. We decided to go with a container home for several reasons: They are quicker to construct than a standard brick and concrete structure, they use far less water to build than a standard brick and concrete structure (which is a huge consideration with our current drought and strict water restrictions), and they can be very stylish. Time to start collecting shipping containers! Building with containers has become quite a phenomenon over the last few years and there are some amazing examples that range from small and quaint, to huge, lavish monstrosities. As with any type of building option, there are pros and cons to building with containers, but we feel that we are up to the challenge and are extremely excited to start the work. So much so, that one of the very first things we did was mark out the ground where the new house will lie (with bottles over the pegs to ensure we don’t trip over them – safety first!). If you want to follow our progress, pick up some DIY tips along the way, and participate in giveaways, please sign up to receive our newsletter and you will be notified when new blog posts are available. I would love to see how this progresses. Please keep us updated. Thank you for your interest in our project, Karen! Did you sign up for the newsletter so that you don’t miss out? Someone there tried to build a strawbale house, but the municipality wouldn’t accept it – so they had to go with concrete blocks sadly. Up at Beaverlac there is a cob house. What a pity about the strawbale house. That would have been a fun project to watch! It is definitely an exciting project for us! We are looking forward to sharing it with you. Maybe one day I’ll upgrade to a container when my caravan falls apart (although I hope it lasts forever). Can’t wait to see your progress on this! I love container homes, you can make them in such a no one will even know its a container, however I love the industrial feel so I would shy away completely from the container feel. I am sure this is going to be an exciting project! We are very excited too and you are quite correct – there is so much you can do! I also like the industrial look and we will definitely be making use of it in certain areas with this project.